Here I'll let you know the different ways you can reach Darjeeling from Bagdogra Airport, also give you an idea about the fares, and then a detailed description of the road journey from Bagdogra all the way up to Darjeeling. Once you reach Bagdogra by a flight, there is a pre-paid taxi counter inside the airport arrival building itself. Note that there are no buses from the airport, neither there are any shared/pool cars or jeeps. If you want to minimize your transportation cost to Darjeeling, one way is to take a taxi and go up to Bagdogra market which is only five minutes from the airport. From here you will get a bus or an auto rickshaw for the Siliguri main bus terminal known as Tenzing Norgay Central Bus Terminus located on Hill Cart Road. 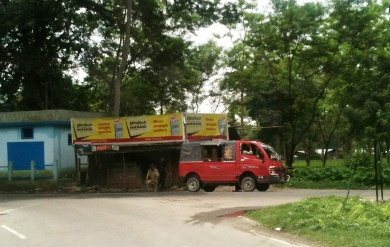 The bus terminus is about 16kms from Bagdogra Airport and takes about 35-mins to reach. From the bus terminus area, you will get buses, shared jeeps and private taxis for Darjeeling. However, from the airport the easiest and the best option is to take a pre-paid reserved taxi for Darjeeling. There is no shared taxi available at Bagdogra airport. However if you can form a group with the fellow passengers (you will often find inquisitive eyes looking for company), it is possible to go out, negotiate with one of the many drivers waiting outside and then share a car to a common destination. Another option is to book a luxury class shared taxi online. However you may need to go through a lot of haggling with the drivers for the rate. You can also otherwise go out and negotiate rate for a reserved taxi. Often you may get much better rate than the pre-paid rate, particularly in off season. But I won't recommend this. However in case of pre-paid taxis, you just pay up the amount at the counter and you will be given a slip. As you go out, there will be volunteers to show you who is your driver and which car you are allotted. You can choose between a small car and a large car (different rates), but can not usually specify a make. A small car will be like a WagonR, Santro etc and a large car like a Scorpio, Innova, Tavera etc. The taxi will drop you at Darjeeling town (i.e. either at Clubside stand next to Gandhi Road or at Chowk Bazaar stand). Usually the taxi driver won't charge extra if your hotel is located close to the town center. Otherwise pay some extra to the driver to drop you at the hotel if it is some distance away from the main stand. Alternatively you will need to take a porter or a local cab from the stand up to your hotel. Many hotels in Darjeeling are in pedestrian only zone and vehicles can not reach up to the entrance of the hotel. In such a case, you will need to walk from the nearest stand. Porters are usually available, the hotel can also help you to take care of your luggage. Checkout Transport fares for Darjeeling to know about all the fares including the pre-paid taxi fares from Bagdogra up to Darjeeling. 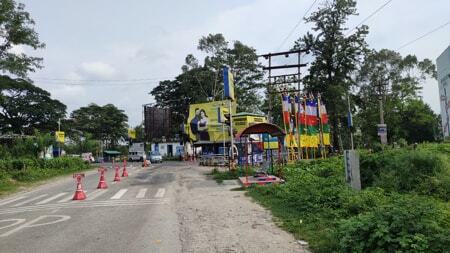 The car park is about 50 yards away as you come out of the Bagdogra airport arrival building. This is where all the taxis are parked. Bishal Tamang, a young Nepali with his own Sumo is my favorite driver. He is not only a charming person always with a smile, but also very friendly and a great driver in the hills with a lot of knowledge. There are several Roads to reach Darjeeling. From Bagdogra, the road distance to Darjeeling hill town is 94kms (if you take the national highway NH-55, also known as Hill Cart Road). It takes about 3.5 hours to reach Darjeeling by car on that route. However the drivers from Bagdogra airport take a shorter route via Rohini or sometimes via Pankhabari if Rohini road is closed for some reason. You save 30 minutes and a distance of 12kms. These roads are however quite narrow, steep and winding. But this is the stipulated route for pre-paid taxis from the airport. So after you start from Bagdogra airport, you will first get to the National Highway NH-31. You will then soon pass by the Bagdogra township and market area, and then the North Bengal University Campus on the left. Soon there will be another township known as Shibmandir (5kms from airport). You will then cross the Balasun river over a bridge (very dusty area full of traffic). As you drive along, you will reach Matigara, a small township which is some 8kms from the airport. Here you will need to leave NH-31 and take a left turn at the crossing towards Simulbari. To take Hill Cart Road (NH-55) for Darjeeling, one has to carry on along NH-31 for few more kilometers for the entry point. But from the airport, drivers will take this diversion at Matigara towards Simulbari for the shorter route. As you drive along this road, initially it's a little dusty and there are small stalls on both sides. Soon the scenery turns green. Through the vast stretches of green fields, you can see the top of a few shrines and cottages at a distance, and far away, the outline of the gorgeous mountains. And you will be heading towards those mountains. After about 15-20 minutes of drive, you will pass through the Khaprail Military camp area. By now the nature has turned to full green, the dusts all gone and you are breathing pollution free fresh air. The mountains have come closer. Don't be surprised if you find your car in the middle of a herd of cattle left on their own on the road. Soon you will pass through the Khaprail village area. And then as you look to your right, there is a vast green stretch of tea gardens running parallel to the road for miles on both sides. And next to the garden are the gorgeous mountains. 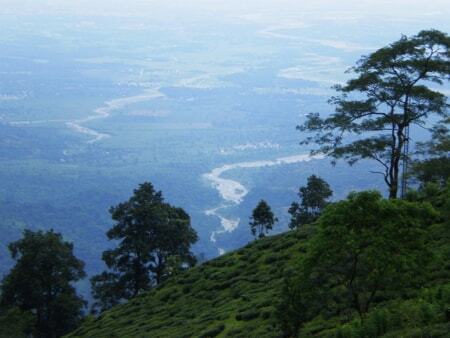 This is the Simulbari Tea Garden which is laid out below the hills in a picturesque settings. 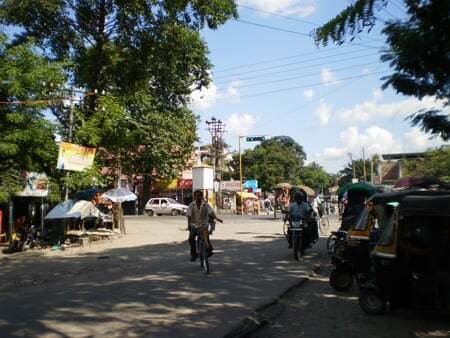 You will then reach the crossing known as the Rohini More in Simulbari area which has a check post with police guards. There are several routes to approach Darjeeling from here - via Rohini, via Mirik, and Via Pankhabari. I shall discuss each route soon. At the Rohini crossing there is a small temporary stall run my a Nepali lady called Sonu. She sells tea and snacks including boiled eggs and samosas (fried veg patties). When I asked her why there is no name to the stall, she told me that wild elephants from the adjacent forests come and break her stall 4 to 5 times in a year, and she has to rebuild it every time. Actually there is a name - Sonu's Stall. She mentioned that she would put up the board again shortly. It's hard to believe the way of life here. But what amazes me is her charming smile despite such ongoing hardships. On a subsequent trip I did however see a big yellow board on top of her stall proudly displaying the name of the stall. This time I did not stop as I took a turn to Rohini road. Sonu was smiling and waving at me as I passed by. The road turning right at the police check post crossing is called Rohini Road. This is the most common route these days and all pre-paid taxis will usually take this route. This is a two-way toll road and goes all the way up to Kurseong where it meets the National Highway NH-55 (i.e. the Hill Cart Road) which then leads to Darjeeling. Update March 2014: The Rohini Road has been recently repaired and is in excellent condition now. It has become a toll road (small cars Rs. 10/-, Innova, Tavera etc Rs. 30/-). Earlier it almost became inaccessible and went through extensive repairs as well as broadening. However it remains steep and narrow at several points. Update April 2018: Rohini Road has now become toll free. It's a picturesque road and you will find several tea stalls along the way to take a break. It takes about 1 hour 20 minutes to reach Kurseong once you take Rohini road and another 1 hour 30 minutes from Kurseong to reach Darjeeling. The road is quite narrow at several areas and there are several steep hairpin bends along the way. Shortly after you cross the toll booth, you will find an abandoned building perched on the cliff on your right. 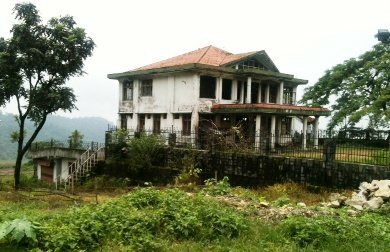 This used to be a DGHC (Darjeeling Gorkha Hill Council) lodge once. It was burnt and destroyed in 1980s during the riots and has remained un-repaired since then. However the scenic setting and architecture of the building is worth a short stop. As you drive up, there are several spots from where you can see the plains below and realize how quickly you are ascending. You can see the houses below are fast getting tinier. You can then imagine how steep the road must be. The Rohini road meets NH-55 (Hill Cart Road) at Giddapahar area in Kurseong. As you get on to Hill Cart Road, you can see the famous narrow gauge Toy Train track of Darjeeling Himalayan Railway running along side the road and crisscrossing it at several points along the way. If you are lucky, you can even see the train moving side by side. You will pass by the Kurseong railway station and then 1km further up you will see the Kurseong Tourist Lodge on the left which is run by West Bengal Tourism Department. The toy train track runs side by side all along the way till you reach Darjeeling railway station. So visit Toy Train Route & Journey and start reading from Kurseong onwards to know about the rest of the route along Hill Cart Road up to Darjeeling. While the Rohini road is the most common route to Darjeeling, you can pay extra fare and take other routes. And there are good reasons to do that, particularly the one via Mirik. It's one of the most scenic and beautiful roads winding up through tea gardens. So take the other road that goes straight ahead from Rohini more, you will soon reach a small village area called Garidhura. There are small shops, stalls and eateries on both sides of the road. Small eateries like Nipun's Hotel serve tea, momos, thukpa and other snack items and even meals during lunch time. The tea at Nipun's Hotel was really nice. It's run by a smiling young girl and her elder brother. Shortly after the Garidhura Market, a road branches out towards left and that road goes to Mirik and then onwards to Darjeeling. The other road continues ahead via Pankhabari village, becomes narrow and steep as it winds up all the way to Kurseong where it meets NH-55 (Hill Cart Road) for Darjeeling. The route via Mirik is one of the most scenic routes I have ever seen in Darjeeling district. This is also known as the alternative route to Darjeeling and it takes about an hour more compared to the other routes. Garidhura to Mirik takes about 1 hour 15 minutes. From Mirik the road continues via Pasupati Nath Market at the Nepal border, followed by Sukhiapokhri, then to Ghoom and then Darjeeling. From Mirik it takes another 2.5 hours for Darjeeling along that route. And on the way you will see lovely tea gardens on open hill slopes. The road winds around the tea gardens on mountain slopes. Between Pasupatinath and Sukhiapokhri, there is a viewing area call Simana from where you can see a winding trail on the opposite mountain that leads to the famous trekking destination Sandakhphu. Along the way you will see many lovely tea gardens as well like Goodricke, Gopaldhara etc. Visit Route to Darjeeling via Mirik for more info about the road via Mirik. Update July 2015: Pankhabari road is closed at present and going through gross repairs and broadening. It will also become similar to Rohini road. The plan is to use it one-way for down traffic while Rohini will be used for uphill traffic. Sometimes I take the Pankhabari road that goes straight ahead from Garidhura. This road is narrow, steep and winding and not suitable for both way traffic. Some times it is made a one-way road to come only downhill from Kurseong. But while going up the taxi drivers often convince the guards at the entrance saying that the car would go only up to a short distance to a nearby place, but actually go all the way up to Darjeeling on that route. Strangely, there is no further check along the way. You will pass by Longview Tea Estate on both sides of the road. 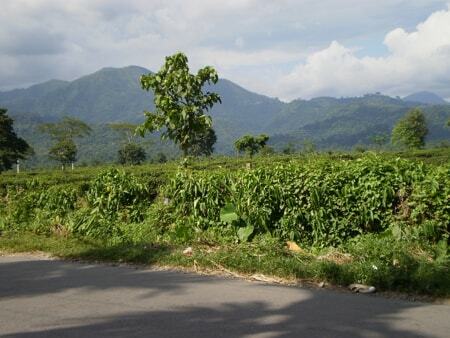 This is the first tea estate on the route that produces Darjeeling brand of tea. This long stretch of tea garden on both sides of the road is laid just below the hills. Soon after some 10 minutes (about 6kms) from Garidhura, the uphill climb will start. The first village as you drive along is Pankhabari and hence the name of this road. At Pankhabari you will see vegetable and small stationery stalls on both sides of the road. The sight of lovely wooden huts on the cliffs and the charm of little kids on the roadside waving at you just sets the day right. After you have driven uphill for a while, there is a point on the right from where you get a breathtaking view of the Siliguri plains below. You can see two rivers, Teesta and Balasun flowing side by side at a distance. Teesta on the left and Balasun on its right. It is this Balasun river that you had crossed along NH-31 over a bridge while coming from the Bagdogra airport. Within two minutes from this point you will reach Makaibari village. This is another neat village with huts on both sides of the road. You will then pass by the Makaibari Tea Estate, owned by Rajah Banerjee, a Bengali in his third generation of family business. This is the oldest tea garden of Darjeeling that has gone on to win many international awards. The villagers here offer unique home stay packages that combine visit to the tea gardens and village tours. 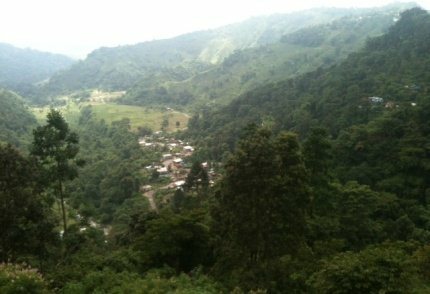 From Makaibari, Kurseong is another 3 kilometers. It is here at Kurseong (altitude 4,864 ft) where the Pankhabari road as well as the Rohini Road finally meet the Hill Cart Road (NH-55) for Darjeeling. From here onwards, it is only one road (i.e. the Hill Cart Road) that goes all the way up to Darjeeling. 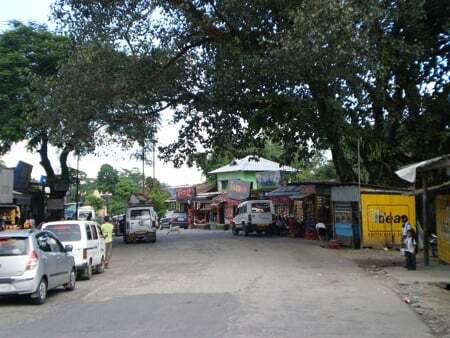 Pankhabari road meets the Hill Cart Road right next to the Kurseong Railway Station. You can easily identify the Hill Cart Road when you see the toy train track running alongside the road. It's much wider too. In fact, the railway track for most part runs parallel and next to the Hill Cart Road all the way up to Darjeeling. Since the toy train track runs alongside the Hill Cart Road, both road and train routes are similar for most part, and so is the journey and view. Visit Toy Train Route & Journey and read from Kurseong onwards to know about the rest of the journey up to Darjeeling. 3) Visit How to reach Darjeeling for complete information about reaching Darjeeling from various places in India and neighboring countries. We will reach Bagdogra Airport by Air Asia flight at 5.25PM. Can we get pre-paid taxi to Darjeeling. Is it safe for going through hilly road from 6 - 9 PM. Or shall we stay night at Siliguri and early in the morning go by taxi/ jeep/ bus to Darjeeling? There will be pre-paid taxis (as they are usually available till the last flight lands). However travelling in the hills after dark is usually not a good idea. Other than safety issues, you wont get to enjoy the scenic views along the way, which is one of the main motivations of travelling in the hills. You don't need to go all the way to Siliguri for staying overnight. There are plenty of nice hotels around Bagdogra and some of them (like Motel Marina) would send a complimentary car for pick up from the airport. You can go through hotels near Bagdogra airport for more information about best accommodations in Bagdogra area. Hello Raj, I have plan to travel Darjeeling in first week of October this year. I will be reaching Bagdogra airport around 4:30pm and move ahead to Darjeeling by pre paid taxi . 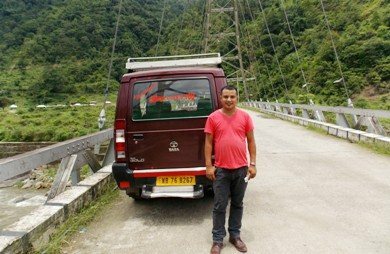 Is it safe to travel by road to Darjeeling from airport after 5pm ? And, is there any issue of fog in the evening during this time of calendar? I have nausea problem in hill areas..... is there too much hill area in this route? Thanks in advance. There is no safety issue as such. Fog is usually not a problem in October, but possible. After the first 30 minutes or so, it's all hilly and winding roads. 1. Should I go for pre-paid taxi counter or talk directly to the taxi drivers. I'd talked to hotel manager for providing a cab facility so he told me that they have Innova and Qualis for that and the charges are 2600 and 2400.Although i've small family and easily adjust in a small car. 2. 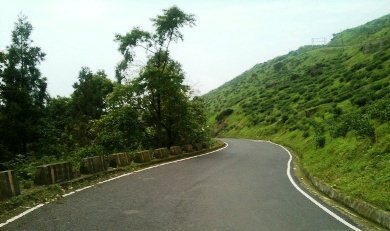 Which road route is better for Darjeeling in your opinion. Raj, We are reaching Bagdogra around 12 noon from Kolkata . On the way to Darjeeling by car, please advise eating places for lunch around 1.30 pm. 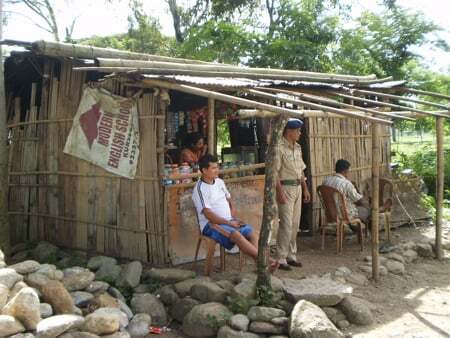 Any clean place serving Dhaba style food food will be preferred. Many thanks. You can take an early lunch at Bagdogra airport. There is a stairway next to the arrival hall that leads to the restaurant in the first floor. It's a nice multi-cuisine restaurant with a bar. Alternatively you can take lunch at Kurseong West Bengal Tourist Lodge. It takes about 1.5 hours to reach Kurseong from Bagdogra. They too run a multi-cuisine restaurant & bar with nice views. Food is okay. There is no other good place to eat in between. If you take a pre-paid taxi, the driver may not agree to stop for lunch in between unless you pay some extra. Talk to the driver and sort this out before you board.